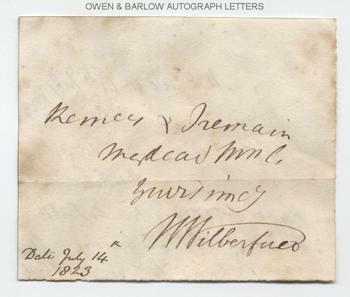 WILLIAM WILBERFORCE autograph Signature on part ALS. British philanthropist and leader of the movement for the abolition of the slave trade. Autograph signature, subscription and part of an ALS on paper piece. London. 14th July 1823. To "My dear Madam". 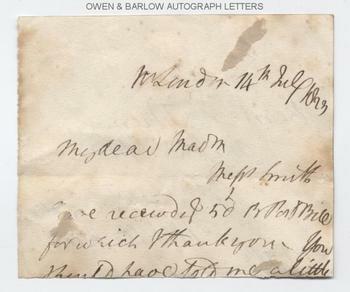 William Wilberforce acknowledges receipt of £50 but remainder of letter is excised. Paper piece measures approx 4 x 4.5 inches. Mounting traces to verso slightly affecting one or two words. Very good. In addition to his leading role in the campaign for the abolition of the slave trade, William Wilberforce was heavily involved in a number of other reforming social movements, including those which advocated better working conditions for chimney sweeps and textile workers, limits on capital punishment, and reforms to prisons, education and the housing of the poor. By 1823 his health was failing but he continued to act as a figurehead for the anti-slavery movement and was engaged in much correspondence and fund-raising for the cause. It is possible, then, that this letter was written in acknowledgement of a contribution towards the fund. William Wilberforce died shortly before the Slavery Abolition Act of 1834 passed into law and so never saw the culmination of his great work.